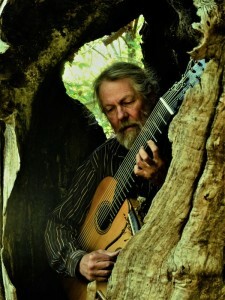 Classical guitarist, composer, and innovator of the 19 string arch harp guitar, James Kline is an artist who constantly renews and reinvents himself. As a classical guitarist he studied in Spain under a full scholarship from the Spanish government. There he won a number of international awards, including the Ramirez Prize of Santiago de Compostella and the Tarrega Pize of Benicasim. He holds an ARCM diploma from The Royal College of Music of London and has performed throughout eastern and western Europe as well as the United States and Mexico. He has also gained recognition as a composer and was awarded an Individual Artist Grant in music composition from the Marin Arts Council of California. As a composer, James draws inspiration from a slightly more unusual life experience which includes years working as a commercial fisherman, working as a wilderness guide, extensive travel on four continents, and living among Mexico’s Tarahumara Indians. An interest in Renaissance and Baroque music led him to design his own version of the eleven-string arch guitar, an instrument which combines the best qualities of the lute and the guitar. The urge to expand his horizons and dedicate more time to composing led James to cofound the neo Celtic group Bardou with whom he performs regularly. He has again reinvented his instrument to become the world’s only player of the 19-string arch harp guitar, a combination of lute, guitar, and Celtic harp. A modern-day troubadour, his performances reflect a wonderful diversity of life experience and musical intrigue and are often punctuated with storytelling.